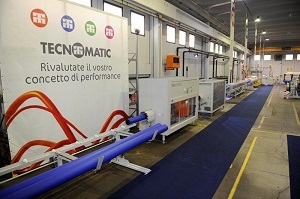 Tecnomatic is an Italian manufacturer of machinery and equipment for production of rigid and flexible pipes. The company’s product range includes complete extrusion lines, single screw extruders (screw diameter from 45-160mm with L/D ratio from 24:1 up to 37:1) and co-extruders, PVC extrusion heads up to a diameter of 1,200mm, extrusion heads for polyolefin pipes up to 2,600mm, multilayer extrusion heads up to 1,000mm, vacuum and cooling tanks as well testing equipment for PE and PVC pipes. These extrusion lines are able to produce a wide range of pipes: LDPE, HDPE, mono or multilayer, PPR, PPH, PE-X mono or multilayer with aluminum (overlapped or welded), multilayer with oxygen barrier, with fiberglass as well as garden hoses, drip irrigation pipes, spiral hoses, U-PVC and P-PVC pipes. Pipe diameters range from 10-2,600mm with production from 4-3,000kg/h.